Please be aware that though this hotel has two floors, there is no elevator. 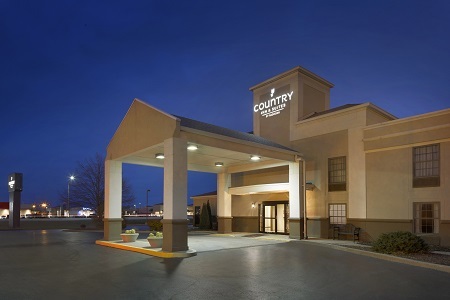 Enjoy direct access to Indianapolis from the Country Inn & Suites® by Radisson, Greenfield, IN, located just off I-70. Our hotel is only 30 minutes from downtown Indy, where you can cheer on the Indianapolis Colts at Lucas Oil Stadium or watch a NASCAR race at the Indianapolis Motor Speedway. If you’re traveling with kids, be sure to schedule a round of mini golf at That Fun Place, just a mile from our hotel. If you need some extra space, upgrade to a Premium Suite and enjoy a separate living area with a sleeper sofa. 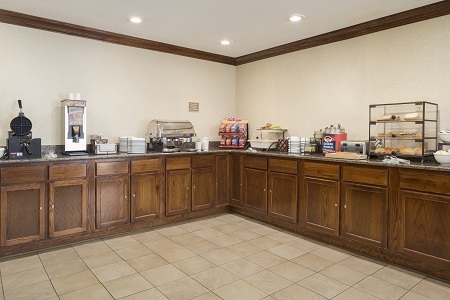 Fuel your day with a crisp Belgian waffle and fresh fruit at the hotel’s complimentary, hot breakfast. When you’re ready for lunch or dinner, try a nearby restaurant like Zapp Thai, located just across the street. Start with the Chiang Mai Salad or the Tom Kha soup before digging into a fiery red curry with jasmine rice. Indianapolis Zoo – Hop on I-70 for 25 minutes to get to the Indianapolis Zoo, where you can wander from the African savanna to the Arctic ice, meeting a variety of animals along the way. Be sure to visit the zoo’s most popular attraction, the dolphin presentation, and sit in the Splash Zone for a cool experience. James Whitcomb Riley Boyhood Home & Museum – Known as the “Hoosier poet” and author of “Little Orphant Annie,” James Whitcomb Riley is a Greenfield native. See his original writings at his boyhood home, just seven minutes from the Country Inn & Suites. That Fun Place – Kids have free rein at That Fun Place, less than a mile from the hotel. Challenge your family to a round of black-light mini golf, and let your kids battle it out in the pirate-themed laser tag arena. Plan an event for up to 30 people in our meeting space, which provides free high-speed Internet access and a convenient location just off I-70. 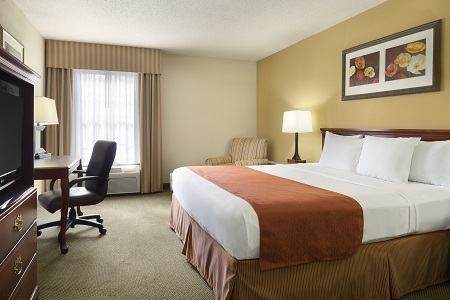 For overnight groups, we offer affordable options for reserving a block of guest rooms. Please note: This hotel does not have a hot tub in the pool area. 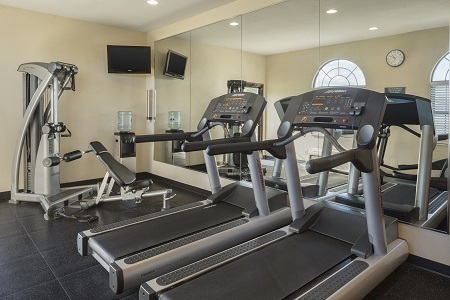 Although it has two floors, the hotel does not have an elevator and offers only stairs to the second floor. 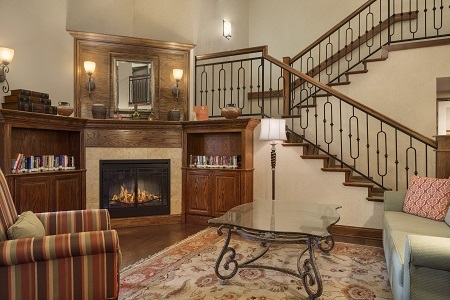 All handicap-accessible hotel rooms are located on the first floor.